Around the world, the popularity and impact of forensic psychology is rapidly increasing. One of the most active applied disciplines in the field of psychology, borne out of cognitive and clinical psychology, forensic psychology or psychology and law is dedicated to the study of the criminal mind, the psychology of criminal investigation and the judicial system and is now a very international field. In spite of its age, the discipline has grown rapidly into a robust academic field in its own terms with numerous journals and societies around the world dedicated to its evolution. 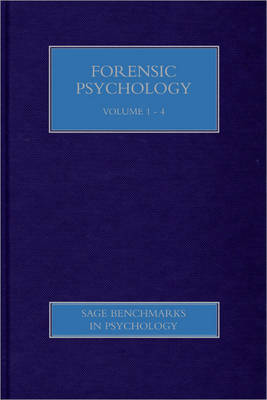 This collection brings together the major influential journal articles in forensic psychology. The collection is a foundation resource and first point of reference for individuals and institutions who seek to build their knowledge and expertise in forensic psychology. Each volume is prefaced by a comprehensive introduction written by the editor.